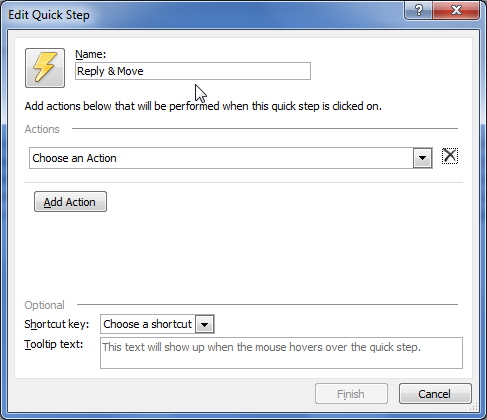 Quick Steps in Outlook 2010 aims to simplify your multi-level message tasks in a single click action.In this Outlook 2010 tutorial, I’ll show you how to automate tasks using Quick Steps so that you can simply your Outlook tasks using a single click action. Quick Steps are basically a series of actions that are executed when you select an email message and click a Quick Step command. 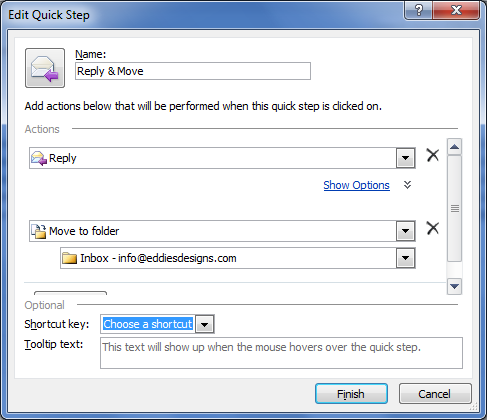 There are a few predefined Quick Step commands in the Quick Step group on the Home tab in the Mail folder such as Move to, Team Email, Reply & Delete, To Manager, Done, and Create New. You can also create your very own custom Quick Steps and include them in the group. For example, let’s say you want to reply to a message and then move it to a folder; you can create a Quick Step command to execute these two actions in a single mouse click. 1. In the Mail folder, on the Home tab, in the Quick Steps group, click Create New. (Or, In the Mail folder, on the Home tab, in the Quick Steps group, click the More button. From the drop-down select New Quick Step-> Custom. 2. The Edit Quick Step dialog box is displayed. In the Name text box, type a name for the Quick Step. 3. From the Actions drop-down list select the first action that you want the Quick Step to perform. 4. If you want to add another action, click Add Action. Note: Depending on the action you select, additional drop-downs may be displayed. Choose the appropriate option from the sub lists. 5. From the Choose an Action drop-down list select the next action that you want the Quick Step to perform. 6. If necessary, repeat the process to add more actions. 7. If necessary, from the Shortcut key drop-down list, select a shortcut key. 8. If necessary, in the Tooltip text box, type the text you want to add as a tooltip. The custom Quick Step is now displayed in the Quick Steps group. 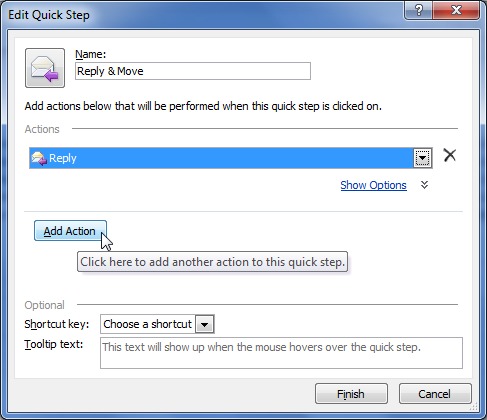 To apply the Quick Step, select one or more messages and then click the newly created Quick Step. 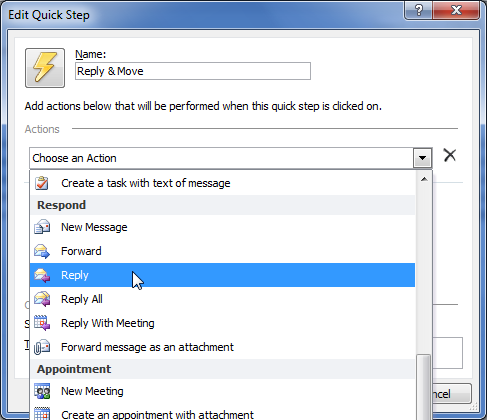 Now that you know how to create Quick Steps in Outlook 2010, automate your routine tasks using Quick Steps.